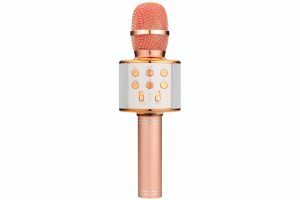 Just in to stock and going fast the new QTX Party Karaoke Microphone Rose Gold and Black for karaoke kings and queens. Showcase your talents wherever you go with this stunning all-in-one singing machine. Insert a USB stick or Micro SD card, loaded with your top MP3s; connect a Bluetooth smartphone, tablet or laptop; or tune in to your favourite FM radio station… then simply sing along! The switchable harmony and echo effects will amaze your friends, and there’s volume galore thanks to the inbuilt 5 watt amp and speaker. Want to perfect your performance in private? Plug a pair of stereo headphones into the 3.5mm output jack and practice to your heart’s content! Get your QTX Party Karaoke Microphone Rose Gold now. Our Top 5 Beginner Acoustic Guitars!